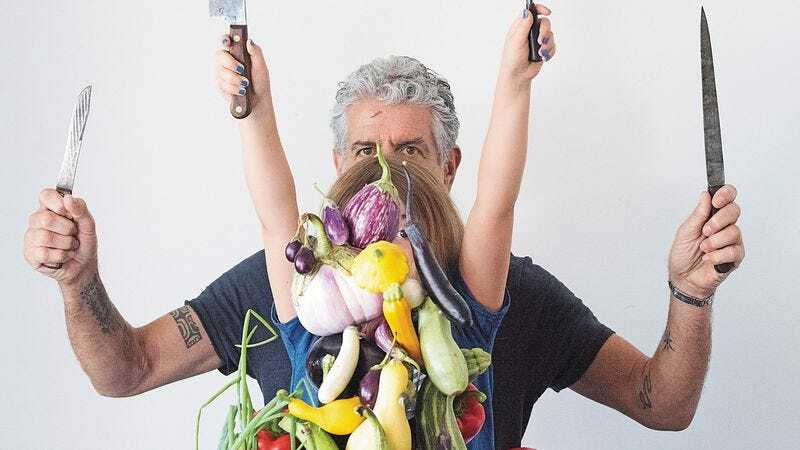 Sixteen years have passed since Anthony Bourdain entered our consciousness, his memoir Kitchen Confidential slicing through the crisp-suited maître d’ ideal of fine dining like a serrated knife through ripe tomato. The book exposed what chefs and servers knew happened beneath the industry’s prim veneer—a pressure-filled kitchen culture manifesting in profanity, vice, and cooks doing gross things to the food of griping diners. Perhaps it was his predilection for salty language (what cook doesn’t drop an F bomb? ), but Bourdain got stuck with the “bad boy” chef label. This is a bit of a misnomer. His television shows—first No Reservations on the Travel Channel, now Parts Unknown on CNN—reveal a man curious and non-judgmental of the world he inhabits. Food is the through-line but rarely the most interesting part of the show. It’s the conversations he holds while breaking bread, with political activists in Beirut, Bedouins in the Egyptian desert, rock stars over Kansas City barbecue, and most recently, with President Obama in a Hanoi noodle shop. Bourdain is on record of saying he’s no journalist, but his interviews are an exercise in open-mindedness. The A.V. Club: Most people who want to become fathers think about it in their 20s or 30s. Your daughter was born when you turned 50. What changed in your life that made you consider becoming a dad? Anthony Bourdain: I guess my whole life, as much as I might have wanted a child for the reason that everybody wants one, I always recognized that at no point until I was 50 was I old enough or up to the job. I thought, you know what, I not only really want a child, but at this point, finally in my life, I think I’m up to the job and I’m the type of person who could do the job well and I’m financially prepared to look after a child. AVC: Was it gradual or was there a specific moment? AB: No, it was like a bolt of lightning realization that I’d be good at this now, finally. AVC: In your book you talk about childhood memories in Montauk and France. When your daughter Ariane was old enough to remember, what was the first food experience that you wanted to give her? AVC: What was on top of that checklist for you? AB: Steamer clams, seasonal corn on the cob, tomatoes from the local market. You know, Jersey and Atlantic shore stuff that I grew up with and had a powerful hold on me. I was overly aggressive with trying to share those things with her because generally speaking, as far as how she’s going to discover food, she grew up with an Italian mother, a dad who is always on TV eating weird stuff. I never coaxed her or even suggested that she try something out of her comfort zone. When she was a very little girl if she wanted to eat pasta with butter everyday that was fine with me, but what else was being eaten at the table was often very interesting and to my surprise and delight she would often reach for a sardine or an anchovy. Some salty pecorino or even raw oysters, she was eating at age 3. It’s wrong I think, morally and annoying in general, to try to get a kid to be a foodie, so I never even suggested, “Hey baby it’s good, maybe you should try it.” That never worked for me. AVC: Is there a particular dish she doesn’t take to? AB: She’s a very harsh critic. You know, I put a tiny tiny little bit of nutmeg in my macaroni and cheese and she did not enjoy that. She called me on it right away. AVC: Did your personal philosophy toward food change when you became a father? Were you more cognizant about what you fed yourself and your family? AB: My wife was easy because she trains [jiu-jitsu] all the time. She’s pretty much on a completely different diet. I always just threw meat at her and she’s happy on a 100 percent protein diet, so we seldom ate together. My daughter, her best friend Jacques, and assorted others who are coming in and out of the house… look, when you have a child you’re no longer the star of the movie. I cook for my daughter when I’m home. I stick with family classics, the stuff I liked as a kid that I’m reasonably sure she’s going to like or proven favorites and then also for her school lunches we do a challenge. She loves cooking shows—unfortunately not mine so much. She loves Alton Brown and Andrew Zimmern. They’re gods to her. She wants to be on, you know, Chopped Junior. I would try to send her to school with something interesting that those other kids definitely don’t have, so I’m sure she’s the first kid to show up in class with sushi or spam musubi. She takes pride in showing up with stuff that other kids envy or are freaked out by, so I send her to school with grilled octopus. AVC: Your daughter’s 9 years old now. What have you learned these last nine years that you would tell me as a father of an 8-month-old? AB: Never try to get your kid to eat anything she doesn’t already want to eat. Just eat interesting stuff in front of her while completely ignoring her. Never, ever suggest “try it.” Never say those dreaded words “try it, it’s good.” Or worse, “It’s good for you.” That’ll poison the well. Eat interesting foods in front of her. If he or she wants to eat grilled cheese, fine. Let them discover it on their own and it will be their own little triumph rather than something you convinced them to do. AVC: Much of your Instagram account is you training for jiu-jitsu. Have your trainers introduced you to a wider world of Brazilian cooking? AB: Not really. When you’re training for jiu-jitsu, particularly if you’re training for a competition, you have to be pretty prescribed in the variety of what you eat. If I’m training I’m cutting weight for a competition. I’m hard. I’m pretty much eating animal protein and that’s it. No rice, no beans, certainly no sweets. So no, I already had a deep and abiding love for Brazilian food. Jiu-jitsu hasn’t exactly been helpful in that regard. It did introduce me to the miracle of the acai fruit, because all the jiu-jitsu people very much believe in the magical powers of acai, and I do like a good acai bowl, and there’s a recipe for one in my book. But yeah, if you’re training in a combat sport, deliciousness takes a backseat. You’re definitely not eating Szechuan. Learn to make Anthony Bourdain’s post-jiu-jitsu acai bowl recipe here. AVC: Outside of New York, where you live, is there any place in the world you would consider raising a family? AB: I had illusions about Italy for a while. Italy is good in the sense that when you bring a child to a restaurant in Italy, they’re happy to see it. The waiters will say “complimenti” and welcome you and dote after the kid. They don’t treat you like you just brought in this horrible probably soon-to-be-squealing creature who’s going to be difficult. In fairness, you know, I’m a big believer in if your kid makes noise in the restaurant you should remove the child immediately. Immediately. And you should never take your kid to a 22-course tasting menu at Per Se. I mean, that’s fucked up. But my daughter always behaved in restaurants. And if she didn’t, she’s going out. I mean, one of the parents is going to take her outside. Immediately. In Italy, kids are taken to restaurants very early, they’re welcome there, and they learn how to behave. You don’t see a lot of screaming crying kids acting out in a restaurant in Italy. They don’t put up with that. So, you know, for another family other than mine, I would say Italy. But, I’m in no position to try to tell people how to live their family life. AVC: So you managed to get President Obama to dine with you in Vietnam on Parts Unknown. How the hell did you get him on your show? AB: They reached out to us over a year ago, so we’d been sort of looking around for a place that would be cool, that would work, and that wouldn’t be bogus and stage managed. You know, I’m not Lesley Stahl. I’m not doing interviews. I just thought that maybe they reached out to me because they liked the show and we’ll continue to do what we always do: go to cool, off-the-beaten path working-class places. Once we decided on Vietnam, we heard the president would be in Vietnam as part of his Southeast Asia swing. [The bun cha noodle restaurant] seemed sort of natural and I know the secret service were less than delighted with our choice of venue. From a security point-of-view it was very unusual for them, but you know, I think it worked out really, really well. And the president seemed to enjoy it. AB: There were no secret service in the room. It was just me, the president, the camera guys, and a producer. We asked everybody to act natural, and they did. AVC: I’m surprised the diners didn’t freak out. AB: Everybody freaked out afterwards. As soon as the scene was over everybody freaked out. And the president was actually incredibly cool and gave a lot of his time afterwards to the people in the room and to our crew. He was very, very kind to us and spent a lot of time hanging out that he didn’t have to. AVC: You ended that segment by telling the president about your daughter. You asked him “Is everything going to be okay?” So, I want to ask you, as a father of an 8-month-old son: Is everything going to be okay? AB: I think on balance. You know, it’s not the world I would have wanted, for sure. I’m certainly dismayed by what I’m seeing now. There’s a lot of ugliness of a kind I’ve never seen in my lifetime, or heard in my lifetime. But, look, I’m a romantic. I’m hopeful. AVC: Lightning round questions. Which country fries the best chicken? AB: Korea. Yeah, no doubt. AVC: Your favorite type of noodle soup? AB: That would be [Vietnamese] Bun bo Hue. AVC: What’s the one cookbook that everyone should own, besides your own? AB: Probably Jacques Pepin’s La Technique. AVC: Tell me a a writer of any genre that everyone should read? It doesn’t have to be about food. AB: [George] Orwell’s essays. It’s got it all. Great writing, a worldview that I find interesting and useful, and most of it timelessly true. AVC: UFC 205. Who do you got? Conor McGregor or Eddie Alvarez? AB: Who’s going to win it? I don’t know, I would guess McGregor, but if you ask me Nate Diaz vs. McGregor III? [Diaz is] going to beat him like a rented mule. Diaz is the best five-round fighter. McGregor is a good two-round fighter. Look, Diaz is going to murder McGregor next time. I think he won the last fight. I thought McGregor was running for the last three rounds, looking at the clock, turning his back with the look of a beaten man on his face. I know Nate a little bit, and look, Stockton, man. Stockton all the way. Always pick the guy from Stockton.